BYD (Build Your Dreams) has delivered the first of 13 K11 60-foot, battery-electric buses to IndyGo, a public transportation provider in Indianapolis. This K11 will serve IndyGo’s Red Line, a 13.1-mile route that runs between Broad Ripple on the north side of the city and the University of Indianapolis on the south side. According to BYD, it will offer more frequent service than current routes. This bus can be charged in 3.5 hours and can also be used as a mobile power supply. 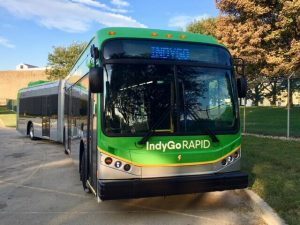 The purchases are part of IndyGo’s plans to replace all of its diesel buses with electric models by 2032. Notably, some of the energy required to charge the buses will be derived from a 1 MW solar system mounted atop IndyGo’s garage.